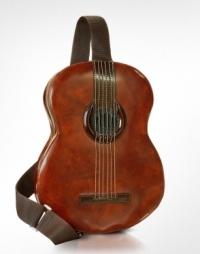 Whether you’re a rocker at heart or not, you can’t deny this guitar backpack is pretty damn cool and looks realistic to boot. Perfect for musos who can’t bear to be apart from their guitar when going about their everyday activities, this bag will help to give that similar guitar-on-back feeling but erm, with the added benefit of actually being able to carry things in it as well (always a good thing to have in a bag). What makes a cool bag even cooler (in my opinion anyway), is the included jack for you to connect up your MP3 player – meaning you can roam the streets or lay down in the park with your beats never too far away. The actual bag is made from vegetable-dyed calf leather (lovely) and is available in either black or brown. It’s $398 from Forzieri.